[Julian] picked up an old record player that was sitting in somebody’s trash pile, and brought it home to see if it could be restored to working order. When he got it home he discovered that it didn’t work at all, so he and his wife decided to modernize it a bit. In an effort to simultaneously reunite himself with his music collection and piss off audiophiles/antique collectors in the process, he gutted the radio and began rebuilding it to serve as an MP3 jukebox. Once the innards were removed, his wife refinished the cabinet and gave the front grill a new cloth cover. An old PC was installed inside the cabinet, along with a set of relatively cheap (but better than paper cone) speakers. 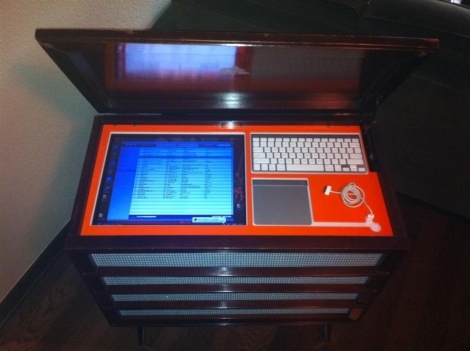 A pair of custom cut plexi panels were used to cover the computer, while providing space for the monitor and Apple wireless keyboard + trackpad [Julian] uses to manage the jukebox. The refurbed record player came out looking quite nice, and although it likely raises the ire of several different groups of purists, we think it’s pretty cool.